Hello. I have spent over 30 years visiting many ancient and mysterious antiquities, but it is the holy well and its allied mineral spring or spa that I have found the most interesting, mysterious and perhaps least studied. My aim has been to record and rediscover such sites and are slowly working through various volumes of ‘In search of England’s holy and healing wells’ county by county. I have already published seven volumes of these researches:Holy wells and healing springs of Essex, Holy wells and healing springs of Hertfordshire, Holy wells and healing springs of Nottinghamshire , Holy wells and healing springs of Derbyshire , Holy wells and healing springs of Lincolnshire, Holy wells and healing springs of Kent and Holy wells of Middlesex and the city of London. If you click the titles you will be directed to Amazon where you can purchase these or alternatively drop me a line and I’ll send them off. More details on my essential reading page. The monthly details of my searches will be detailed in this blog. I have naturally been visiting springs in other countries and will detail these in the blog as well. Hope you find my accounts interesting and please feel free to contact me, make comment and suggest sites. 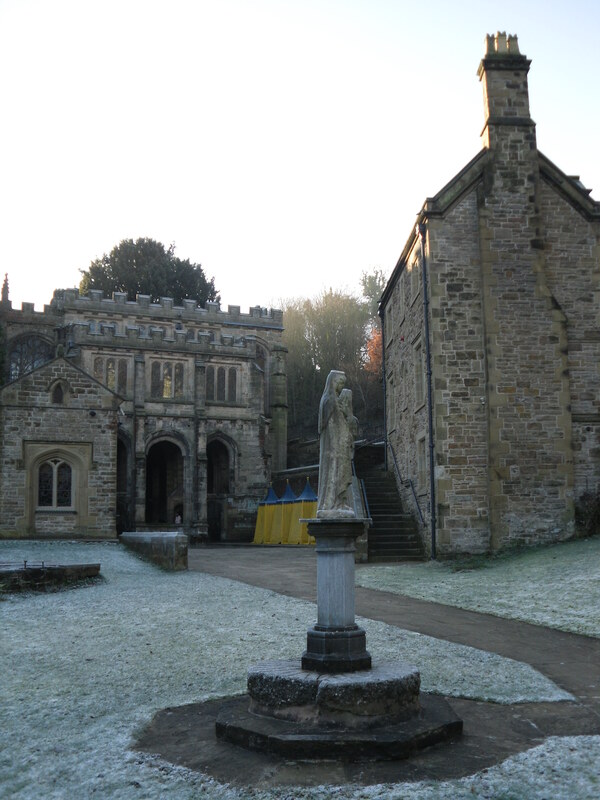 St Winifred’s Well on a frosty December morning. Some interesting info about the well in Kilburn you were interested in. I just came across it via a Kilburn facebook page. Doesn’t sound like the kind of water ‘d like to put my lips to! Are you the chap who I asked at the library? Didn’t find the well but where it might have been which is a big shame! Thanks for the link appreciated…I don’t think many of those mineral springs were great…Bath is an acquired taste! Interesting that holy wells and sacred springs cult was successfully adopted by Russian Orthodox church. Nowadays thousands of pilgrims visit the sacred springs and holy wells in Russia. Most of them are looking for the spiritual magic healing and curing of various illnesses. Robert Charles Hope’s introduction gives a clear idea of the Christian mindset concerning Holy waters. The Orthodox Church, to which England was a member until 1066, retains its deep understanding of the spiritual significance of water; it is not something which was “successfully adopted” but which has been anciently understood. Hello Ross. Tanks for your blog, it has interesting subjects. I’m Spanish, living in Lincolnshire at the moment, and wish to visit some holly wells here… I’m interested in your guide of Lincolnshire, but it’s unavailable in Amazon. Could you please send it me? You can do it to: marialeguerra2000@hotmail.com Thank you very much!!!!! I’d like to buy a copy of your Essex Book please. Where shall I send the money? Hello. How do I buy your Essex books please? Hello Stephen. I may have run out of copies at the moment. I shall have a look..hopefully I’ll be repressing in the new year. Here in Cosgrove, Northants we have a well called St Vincent’s but I can find out very little about it – mostly anecdotal from older people in the village and the fact that it was protected by Act of Parliament at the Inclosures of 1767 and then when the Grand Junction Canal ploughed straight through the village in 1795. Our information is at http://www.cosgrovehistory.co.uk/doc/well/well.html. We would be very grateful for any further insights! “on a green or common adjoining to the town is St Vincent’s, corruptly called Finche’s well; a mineral water, resembling in its quality that of Astrop (a well known spa), and of a like efficacious nature in the cure of disorders”. I like the idea of tracking the wells. just to let you know that I live in Chislehurst in Kent and there is a wood behind where I live in St Pauls Cray, Orpington. There is a pond there that was thought to have been used by sunworshippers by a tribe of people called the hoblingers, however some say the hobgoblins and it is said there was a bronze age settlement there. My next door neighbour actually has the well in her garden of her house ‘Hobbs Well’ and the lane at the back of my and her house is actually a road that was used by canterbury pilgrims leading to old Robin Hood Cottages where there was an inn there. It is a very spiritual place for me but recently a group of people called ‘Friends of Hoblingwell’ have been changing this into a park with steps and pond widening etc. They plan to do some archaeolgical work there, I actually have a video of my neighbour talking about the well and how ancient earthworks were found around the pond. She has also found old artefacts in her garden. It seems there isn’t much known at all about the area, although I’ve tried to find information in the libraries. Maybe this would be of interest to you too. What is the name of your book please? I wasn’t aware of the tribal explanation, but to be honest very unlikely, the name Hob is a very common name for a spirit and is associated with springs countrywide. The clue is in the name of the cottages…Robin hood or robin good fellow is another spirit name. The two commonly appear together. If you read the blog piece it’ll give you some theory to why. Good to see it’s being preserved as it’s probably the only recognisable hob well in the country, the others I believe are only preserved as field name records. It is in the book, holy wells and healing springs of Kent incidentally. Good luck in any future research be interested to read about it. Hi Stephen if you are still interested I have a copy available. Hello, does anyone know where and how I might get a copy of the Holy wells and healing springs of Lincolnshire? Any help would be much apreciated as it seems to be sold out everywhere. Hi david I have just privately messaged you. From me is the short answer. May I have also a copy? Newstead: Hollinwell (SK 527 545) you write ” The origins of the name are confused; it is probably recorded in 1307 as Hollewellcraft, being part of the lands owned by Newstead Abbey”. This is unlikely as this land was not owned by Newstead Priory. I have been to what is now Newstead Abbey and examined their maps and several since the 1100s and area owned by the Priory or the Byron family or others since never included this area. A map by Bankes R., Sherwood Forrest in 1609: A Crown Survey, shows a picture of what is probably Mosley Spring & Leen Head but it does not show Hollinwell. In 1774 John Chapman printed a map that included Mosley Spring & Leen Head as did John Carey in 1805. It was only in 1836 and the first ordnance survey map (1 inch to 1 mile) does the name Hollinwell appear and this is separate from Mosley Spring & Leen Head that is also marked. Mosley Spring & Leen Head is a large spring that is not readily apparent being under a pond behind the 5th green. Its outflow is considerable, and more than the Hollinwell, and it has been diverted to the right of the 6th tee where its large outflow can be seen. Hollinwell has been extensively cleaned up to reveal three springs above the sandstone framed by blocks of stone. I cannot find out who placed these stones in position but they were present in the early 1900s but it was overgrown then (photographic evidence). If you have any reference for the name Hollewellcraft in 1307 I would be interested to know it or indeed any other information on the origin of Hollinwell. The address is Plessington House, Greenfield St, Holywell CH8 7PN. The shrine is open daily throughout the year, with the exception of Christmas Day and Boxing Day. Hi Martin. I do know the site and was working on a book on the county when I lived down Bristol way. I had a friend whose parents lived in the Manor House at Tytherington incidentally lost contact years back though…there isnt a huge amount I found about the well other than as normal it was good for eyes. However, there is quite a number of such sites in a small area such as a seven springs site (often anglosaxon) and St Mary’s Well. I would add I’ve found that sites purely known as holy wells can often be some of the oldest such springs such as Anglo Saxon coming from o.e Halig later ones received saint names. Thank you. Where did you discover that Holywell Water is good for eyes, interesting ?. We are now looking into local records.